Today’s bike pic, we found this biker couple, in the HFB archives, riding the Tour D’ Amico 4th of July bike ride. And what better way to continue your fun, finding your #NextBikeAdventure. See all the great ideas and bike destinations in the 2019 Bike/Hike Winter Planning Guide. Then plan your next outing with family and friends in one of Minnesota’s HaveFunBiking Destinations. Watch for our spring print guides in April. As 30-Days of Biking progresses in April, the spring 2019 Bike/Hike Guides will be available in both print and digital format. So bookmark HaveFunBiking.com and find your next adventure. Please share all our pic’s with your friends and us on our Facebook and Instagram. Don’t forget to smile; we may be around the next corner with our HFB camera, ready to capture you for the next ‘Pic of the Day’ posts. 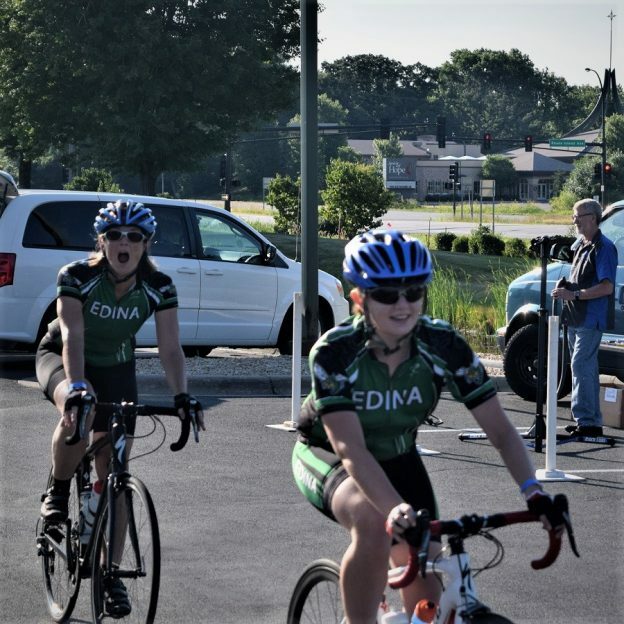 This entry was posted in Picture of the Day and tagged 4th of July Bike Ride, bike tour, D' Amico & Sons, Edina MN, Minnesota trails, picture of the day, TDA, Tour D' Amico bike ride, Visit Edina on February 11, 2019 by Russ Lowthian. Today’s bike pic, we found these Edina biker chicks, in the HFB archives, riding the Tour D’ Amico 4the of July bike ride? 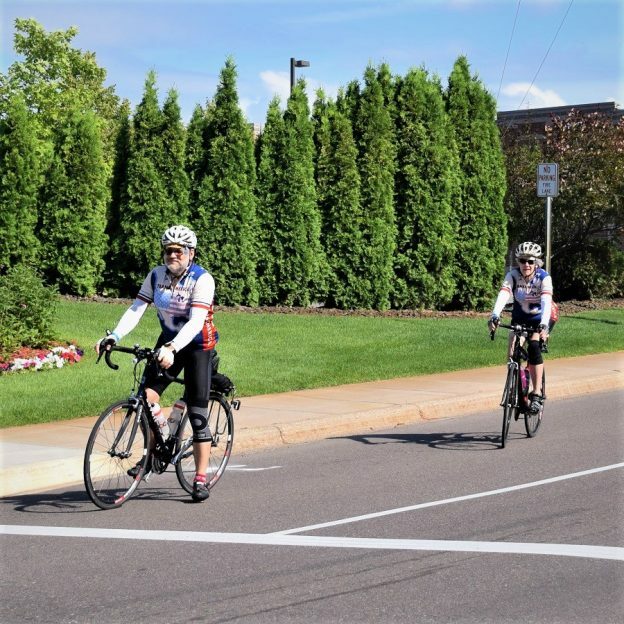 This entry was posted in Picture of the Day and tagged 4th of July Bike Ride, bike tour, D' Amico & Sons, Edina MN, Minnesota trails, picture of the day, TDA, Tour D' Amico bike ride, Visit Edina on February 4, 2019 by Russ Lowthian. A bike pic to remember! Digging through the archives, this photo was taken this last summer on the Tour D’ Amico just before a sudden rainstorm. This entry was posted in Picture of the Day and tagged 4th of July Bike Ride, D' Amico & Sons, fun, Golden Valley MN, Hiawatha Bike Club, pic of the day, TDA, Tour d'Amico on December 6, 2018 by Russ Lowthian. Tour D Amico is not a bike race. Its just a fun 4th of July cycling event that guarantees that everyone who participates has fun riding a scenic route with a delicious Italian picnic served at the end. Get into the zone and plan your next bike outing with family and friends at one of Minnesota’s HaveFunBiking Destinations. View all the fun ideas and bike destinations in the latest Minnesota Bike/Hike Guide. Thanks for Viewing Our ‘Tour D Amico’ Pic of the Day! Remember, bookmark HaveFunBiking.com on your cell phone and find your next adventure at your fingertips! Please share our pics with your friends and don’t forget to smile. We may be around the corner with one of our cameras ready to document your next cameo apperance while you are riding and having fun. You could be in one of our next Pic’s of the Day. This entry was posted in News and tagged #nextbikeadventure, 4th of July Bike Ride, bike event, D' Amico & Sons, Golden Valley MN, good eating, Hiawatha Bicycling club, Italian picnic, Minnesota Bike Guide on June 29, 2017 by Russ Lowthian. 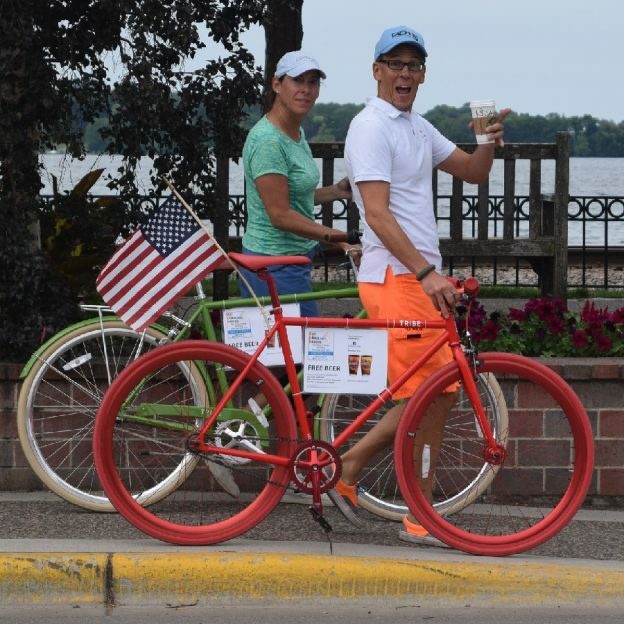 Here are a couple cyclists living the American dream by promoting free beer as they walk their bikes down the street in Wayzata, MN, with a Latte in hand. Photo was taken during the annual Tour D’ Amico 4th of July bicycle ride. 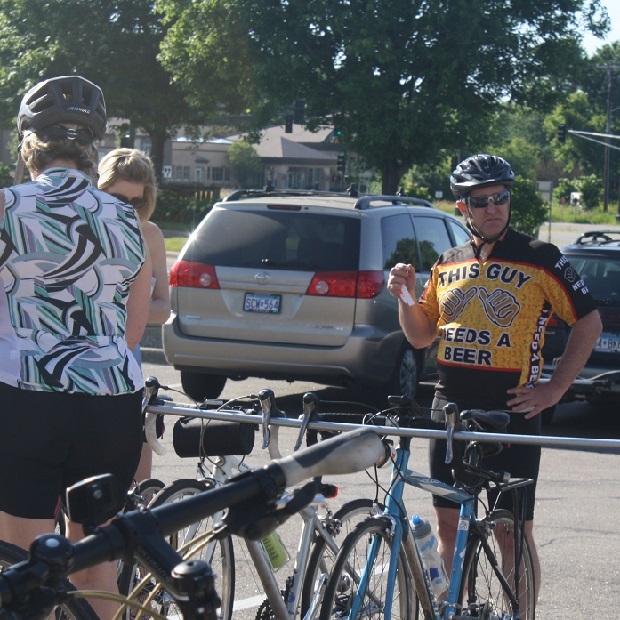 Now in its 18th year, the ride is promoted by the Hiawatha Bicycling Club. 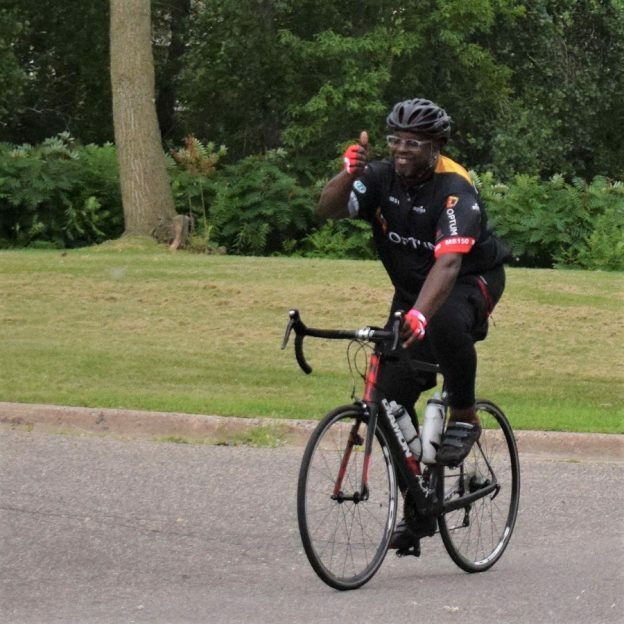 Proceeds from the ride benefits the Bicycle Alliance of Minnesota’s bike education program and trail maintenance projects around the Twin Cities and the Minnesota Specialize Olympics. See many more bike events friendly places to explore in the new Minnesota Bike/Hike Guide. Thanks for viewing the American Dream Pic of the Day. Now rolling into our 10th year as a bike tourism media, our goal is to continue to encourage more people to bike and have fun while showcasing all the unforgettable places for you to ride. As we continue to showcase more places to have fun, we hope the photos we shoot are worth a grin. So go ahead and scroll through the information and stories we have posted and enjoy. So, do you have a fun bicycle related photo of yourself or someone you may know that we should post? If so, please send your picture(s) to: editor@HaveFunBiking.com. Include a brief caption (for each), of who is in the photo (if you know?) and where the picture was taken. Photo(s) should be a minimum of 1,000 pixels wide or larger to be considered. If we do use your photo, you will receive photo credit and acknowledgment on Facebook and Instagram. So bookmark HaveFunBiking.com and find your next adventure. And don’t forget to smile while you are riding and having fun. We may capture you in one of our next photos that we post daily. This entry was posted in News, Picture of the Day and tagged #4thofjuly, #fourthofjuly, #next adventure, #nextbikeadventure, #onlyinMN, 4th of July Bike Ride, Beer, bikes, D' Amico & Sons, Living the America Dream, Tour D' Amico, Wayzata on September 29, 2016 by Russ Lowthian. If this guy had a beer in his hand, rather than a tissue, do you think he might crack a smile? Photo was taken last summers at the annual 4th of July, Tour D’ Amico Bike Ride & Picnic, held in Golden Valley, MN by Hiawatha Bicycling Club (HBC). Thanks for viewing the Bike Pic of the Day here at HaveFunBiking (HFB). Now, rolling into our 10th year as a bicycle media, our goal is to continue to encourage more people to bike, while showcasing unforgettable places to ride. As we search and present more fun photos worth a grin, scroll through the information and stories we have posted to help you find your next adventure. Then, while out there if you see us along a paved or mountain bike trail, next to the route you regularly commute on, or at an event you plan to attend with your bike, be prepared to smile. You never know where our camera’s will be and what we will post next! Do you have a fun photo of yourself or someone you know that you would like to see us publish? If so, please send it our way and we may use it. Send your picture(s) to editor@HaveFunBiking.com with a brief caption (of each), including who is in the photo (if you know?) and where it was taken. Photo(s) should be at least 620 pixels wide for us to use them. If we use your photo, you will receive photo credit and an acknowledgment on Facebook and Instagram. As HaveFunBiking continues to encourage more people to ride, please reference our blog and the annual print and quarterly digital Bike/Hike Guide to find your next adventure. We are proud of the updated – At-a-Glance information and maps we are known for in the HFB Destination section on our website and in the guide. Now, as the Bike/Hike Guide goes into its seventh year of production, we are adding a whole new dimension of bicycle tourism information available for mobile devices where you may see some additional bike pics – maybe of yourself so. Bookmark HaveFunBiking.com and find your next adventure – we may capture you in one of the next photos we post. 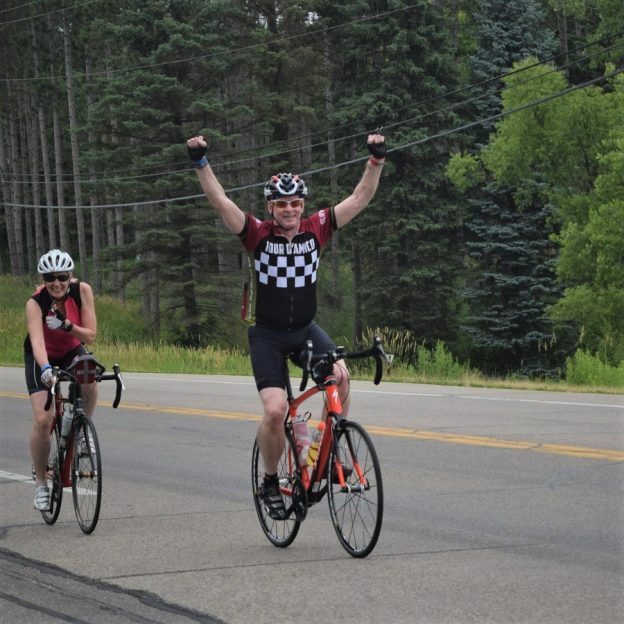 This entry was posted in News and tagged #FindYourNextAdventure, #onlyinMN, 4th of July Bike Ride, A Minnesota Bike Event, Bike and beer, D' Amico & Sons, MN Road bike Ride, MN trails, Tour D' Amico on February 13, 2016 by Russ Lowthian.